Since in our department we are discussing specifics in this area, I thought I would post my working list of skills, partly because I had fun generating the various verbs. I plan to test the efficacy of these labels by tagging homework assignments posted on our course’s blog. This may be a useful way to hold myself accountable for guiding students in exercising these skills. I am trying to make the list fairly inclusive while also manageable, and, as a bonus, memorable. p.s. I wonder if I can string these together into a meaningful schema; I’m still playing with that possibility. As the picture shows, I am posting them above the white board, too–for regular reference and reinforcement. 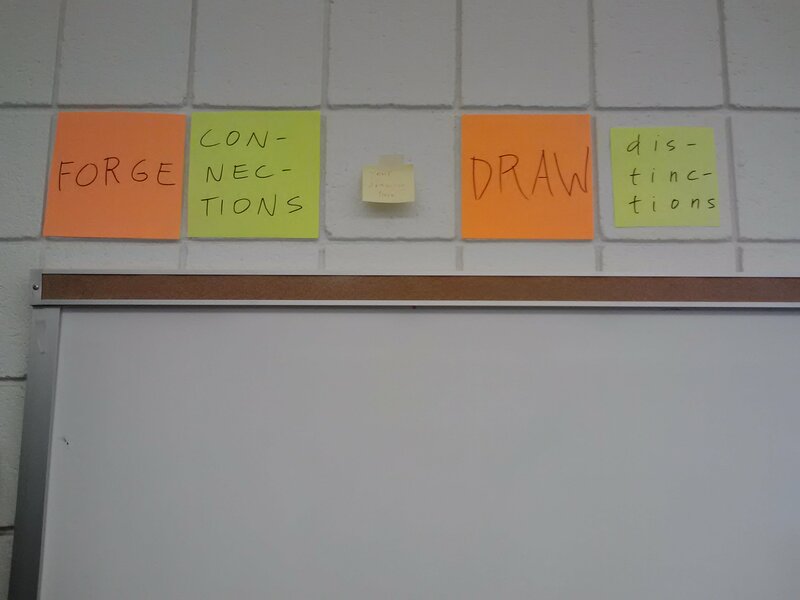 The little post-it signals the possibility of students’ placing an original piece of visual art to render each skill. Time will tell.